Melanie Manansala, a Filipina domestic helper has received the title of "2017 UAE's Best Nanny"
Dubai – A Filipina domestic helper who loves children and is passionate about what she does was crowned the UAE’s Best Nanny this year and will take home a million peso retirement fund. Melanie Manansala, 44, won the title on Saturday because of her positive qualities: being open, honest, balanced, committed and knowledgeable. The award, now in its second year, is an initiative of Rise, a wealth management platform for migrants. The award received more than 500 nominations from families all across the UAE. Manansala used to work as a tailor in a factory in Pampanga. She flew to the UAE in 1993 to work as a nanny for a Lebanese family where she worked for 12 years. Having worked in the UAE for 24 years, she is now working with another family but has not lost touch with the previous one. Manansala was ecstatic when she heard her name being announced as the winner. Manansala is set to receive one million pesos for the award. “I’m so happy with the award, I almost can’t believe it! I’m already saving for my retirement, which I believe is very important, and every nanny should do so too. With this prize, my dream can come true to open a supermarket in my home country after my retirement as a nanny,” Manansala said. 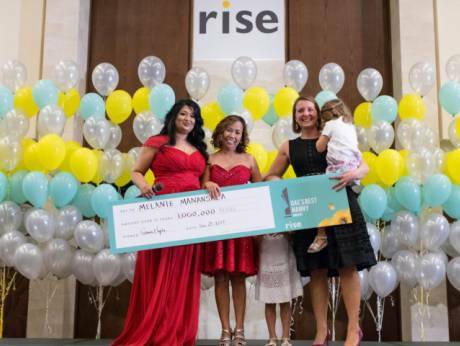 Manansala also thanked Rise for the great initiative of appreciating all the hard-working nannies in the UAE. During the function, Manansala said she started saving for herself four years after her brothers, who she used to support, landed good jobs. In her entry, she recounted how having no savings or reserved fund during a personal emergency taught her to pay herself first after getting her salary. She realised that it’s crucial to make savings a priority so she can have cover on rainy days. “I realised that if I don’t have anything and if I don’t save anything, nobody will help me. So now, whenever I see new nannies I always teach them how to save. Even Dh100 tucked away each month [will do],” she said. Apart from winning one million pesos (around Dh73,000), Manansala also won a ticket to the Philippines from Air Arabia, a bank account, Rise child care courses and more. Padmini Gupta, Founder of Rise, said nannies play a key role in our society and deserve recognition and appreciation. “They [nannies] represent one in four women in this country and one in two working women in the UAE, however, they are often not appreciated nor supported by society.